Wiregrass Technical College wants to expand onto some land owned by the Industrial Authority, using SPLOST funds. The point is they're landlocked. Long term land lease. 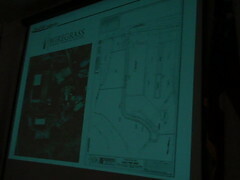 ...SPLOST referendum developing tract, putting in the access, $3 million improvement. Our partnership would be the land. Their partnership would be the SPLOST referendum funds. So they're looking at basically a lease. Further explanation of what's shown on the map and how this has come up at least twice before. They appear to be referring to the ESPLOST referendum that passed that same day. It seems VLCIA is not just industry; it also may help education. Land bought with our tax money leased (??) using other tax money. Very shady!! The IA should sell it to them for the same amount that they bought it for. The IA should not be landlords for the college that is absurd for a number of reasons. Most importantly, the college is not an industry but rather it trains individuals for industry jobs in this area (ideally).